« Bike to Work Week…In the Fall? 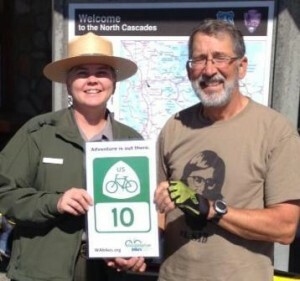 WA Bikes board member John Pope is pedaling the newly designated US Bicycle Route 10 across Washington’s northern tier. His wife Michele is providing vehicle support and she submitted this post about Day Two. What a wild and wonderful day on USBR 10. We had a late start due to not one but two tire blowouts. Then halfway through the day John decided to switch saddles, going back to his tried and true Brooks Saddle. 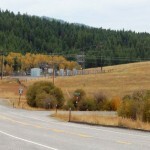 The uphill sections began with the narrow roadway through the Skagit River Gorge with activated tunnel beacons and a high bridge. After Ross Dam you get a sense of uphill, but the real grind begins along Granite Creek where the road shoulder becomes rough and the fast cars feel the need to get going really, really fast. 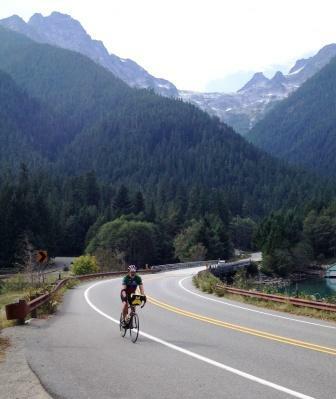 The steep climb to Rainy Pass was helped by views of the high mountains, followed by a short downhill to Bridge Creek, then a final climb to Washington Pass and its views of Liberty Bell and spires of Early Winters. The payback after all that climbing is a 40 mph downhill with sweeping curves from Washington Pass to Early Winters Campground, where we stayed for the night. You really get the sense of fall in the air when traveling at such a speed. Leaves are starting to turn. There was a constant cascade of falling leaves along with the coolness that air takes on with the changing season. We met some fellow travelers on our journey today. Some were eager to chat while others saw their destination on the other side of the pass and kept a steady pace. One couple that stood out were Preston and Wendy from Bellingham. 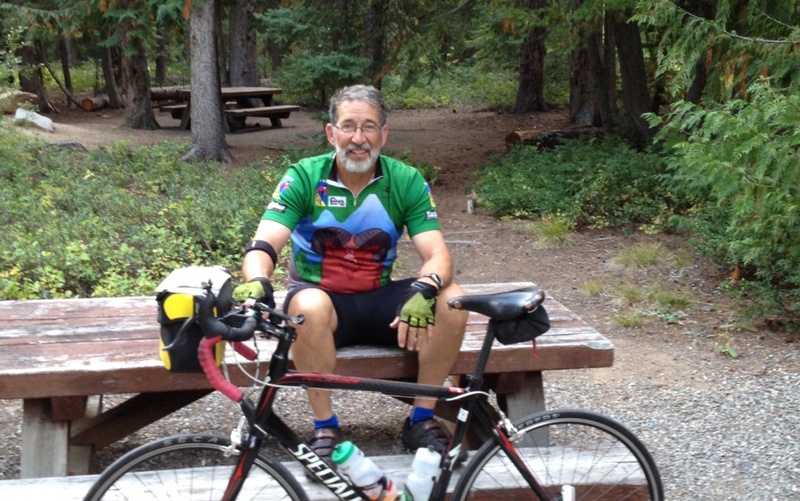 They spotted John at the Diablo overlook and asked if he was the bicyclist that was biking the new USBR10! They were very enthused and excited to have run into him after reading the article in the Bellingham Herald. What occurred to me, as the sag wagon observer, is that you will be hard pressed to find more glorious views than the passes that we went over today. It reminds me how lucky we are to live in this corner of the world. It also reminded me that riding a bike on such a journey is a testament to dedication, tenacity and loving to truly experience life. You may wonder about the “El Sid” t-shirt that John has been wearing. Here is the back story. 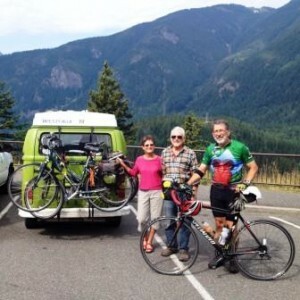 John’s journey over the pass today was dedicated to our brother-in-law Sid McHarg, who was a lifelong bike commuter in Seattle until he was hit by a car while returning home from work. We are happy to say that he survived the collision but many broken bones later he is no longer able to ride his bike the way he had enjoyed. A reminder to always be mindful of the humans sharing the road with us. Everyone is a story. Day Two Stats: 57 miles ridden with nearly 5000′ of climbing. 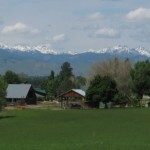 This article was posted in Adventure, Guest Blogger, Rides, Skagit County, Travel, USBRS and tagged bike travel, usbr10. Bookmark the permalink. Follow comments with the RSS feed for this post. Both comments and trackbacks are closed. 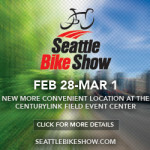 I rode that section this past June, but in the opposite direction. It’s one of the most beautiful areas I’ve ever biked through! Spectacular.